Based on the popular and well proven standard 350, now with the all new unit construction engine, this is classic motorcycling with a modern twist. The Bullet uce looks and sounds like a classic British single, but with a significant performance boost, excellent fuel economy and significantly reduced exhaust emissions. The Bullet standard is a classic motorcycle, simplistic in design with a new, robust and reliable unit construction engine. Comfort takes a front seat with gas filled shock absorbers and a sub frame. How does the new Royal Enfield bullet Twinspark look? 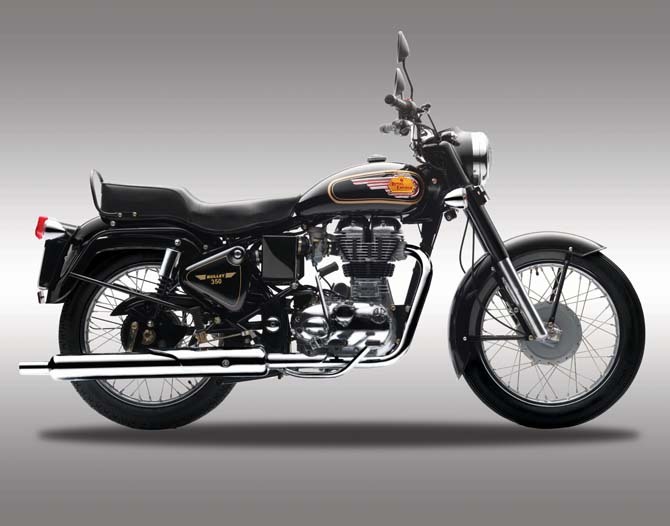 The new Royal Enfield bullet 350 Twinspark kept the looks of the vehicle unchanged; it is simple and maintains the conventional style. Despite the looks being standard it still looks gorgeous and bold, which is a characteristic feature of any Royal Enfield motorcycles and the stand-out feature of the new bullet Twinspark is its finishing quality. 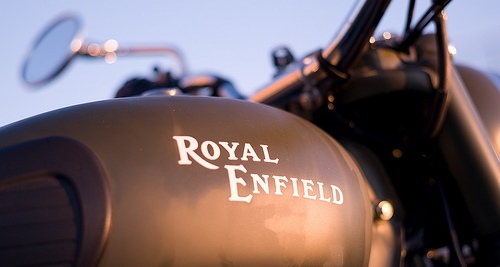 The huge metal logo of Royal Enfield on the fuel tank looks stylish and the front mudguard is cool. The neutral finder makes it easy and convenient to shift to neutral. The seats are kept wider and flatter, so there are not many modifications in the looks department of the new Royal Enfield Electra Twinspark as compared to its predecessor. As regards digitalization Royal Enfield still lags behind the Bajajs and the Hero Hondas. The new Bullet Twinspark doesn’t sport digital speedometer and doesn’t sport a tachometer too. The new Royal Enfield bullet 350 uce Twinspark is powered with a 346cc engine that generates a maximum power of 19.8 bhp at 5250 rpm and a torque of 28 Nm at 4000 rpm. The motorcycle company claims that the bullet 350 Twinspark that the bike will also be able to hit maximum of 120kmph speed. As regards the Unit Construction Engine (UCE) it gives fewer maintenance issues, the company remarks. However, it is early to jump the gun and can be proved only after a driving it for sometime. This according to the company brings about greater optimization of air-fuel combustion as well as improved power delivery with reduced emissions. There are certain claims such as low maintenance made by Royal Enfield as regards to the new bullet 350 but until you own one it is hard to decide the handling of the bike and probably a test ride will help you come to one opinion. Low maintenance as claimed by the company can be one discussed after a year from now and it is too early to talk about it now. The company failed when it came to this with many of its models. The new Royal Enfield bullet 350 Twinspark kisses the road with loads of promises from the company; of performance and fuel efficiency but the physical features are hardly touched upon, which could keep the bike away from buyers. The new UCE engine is the only feature of the bike that is something worth looking at this point in time. And, only time will tell if the new Twinspark will survive in the market based on this new UCE engine technology; there is so much competition ahead with the influx of super bikes and the camp at the Royal Enfield will be hoping so it will still be able to cling on to the loyal Bullet fans. Nice review though…had these models hit the showrooms yet? if not, how long will it take and what will the expected price range.??? I am owning a Twinspark Thunderbird and previously a ci350. I would say that the new UCE is 100% problem free that the old dabba Ci engine. CI used to give me starting trouble, oil leak, poor reliability, vibrations etc etc. UCE is a true boon, with better reliability, less breakdowns, no oil leaks and smooth drive. Only missing factor is the Thump..but with upsweapt silencers , it is not an issue as well. I have experienced both the engines and believe me nothing like the old CI engine. Truly speaking, due to the pollution norms, the company was forced to shut the old CI engine and come with UCE. Otherwise RE would have never ever stopped CI. A engine ruling the bike world since 1948 is definitely a proof of master engineering. A engine is replaced when something better comes. That is the reason why other companies models come and go, but RE’s CI engine was never replaced. It is only the norms which forced RE to switch. I agree that new UCE engine has certain advantages over the CI engine, but these you can also find in other bikes. In this sense other plastic bikes are better than new RE bikes. This is just what I feel and have experienced. Everyone is powered with thier own brains. Recommend you to ride both the engines (for at least 100 KMs) and come to conclusion. @anonymous don't take so much tension dude !! uce based enfield's are easy to maintain, gives you more mileage, for your knowledge iam getting around 39 to 43 kmpl... hv fun !! I found it very nice and wonderfull look .I found it one of the most beautifulmodels of royal enfield.I am so happy to see it. man i completely agree with your views !! all the best for your new companion !! @wobby these days ppl look for milege, trouble and maintainance free motorcycle but they ignore the best part ''riding pleasure'' i have a 1968 bullet nicely maintained and iam loving it !! gud luck !! Recently I booked STD350 UCE, and hopefully I will be getting delivery of my bike near Diwali. I want to know one thing about the bike, does the new UCE comes with auto decompression or their is some knob for decompression like the old models. If their is auto decompression then what is the fun for amp meter in the bike. @ankit congrats dude !! yes all new uce based royal enfield motorcycles come with auto decomperssion !! fun?? i dont know. Hi Guys, good comments and reviews, am truly and madly in love with this Bike, planning to book one, but am lean so just wondering if i can go for this bike.. i weigh just 65kgs and 6 feet.. Wht do u guys have to tell abt it..
hey aks your weight and height combi is absolutely fine dude !! don,t listen to anybody.. if u like it go for it !! i have heard that std UCE has heavier crank than other 350 UCEs .is that correct.? @mohit No,they share same engine. no difference at all !! I'd suggest you to go for the model you love the most. By this I mean, all 350cc UCE engine are same so choose the model you find visually pleasing. For your kind information there is no neutral finder in this new model. So please do not post wrong information.